My favorite day is when I work out my arms at the gym, as you saw in my "arm workout" post. Slowly, but surely, leg day is growing on me. I've never really been a fan of my legs, as they are my trouble area and the hardest part to lean out. I always wanted that "thigh gap." Now that I've been seriously focused in fitness I realize I don't want that gap. I want strong, toned, healthy legs! Anyways...here is my workout. I decided to post my workout without the use of machines, which I almost prefer anyways. Now you have no excuse because you can do it anywhere! 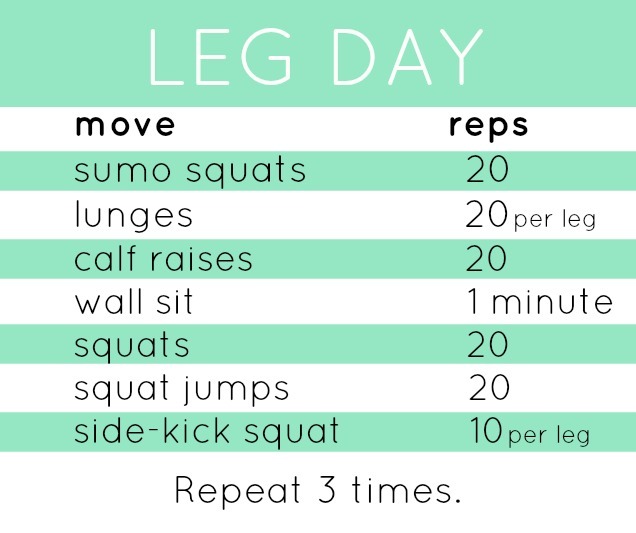 today is my leg day and I'm definitely gonna try your routine now :) Have a good one! can you recommend some good exercises that don't require equipment for toning your bum? haha. i know squats are good and i do glute bridges too, any others? thanks hun! !